Most of the smart thermostats we’ve evaluated—from the likes of Nest, Honeywell, and Ecobee—are low-voltage devices designed for central HVAC systems (even if not every home has central air conditioning). The Sinopé TH1120RF Web Programmable Electric Heating Thermostat is designed for more specialized line-voltage heating systems: Electric baseboard, convector, and radiant (in the floor or ceiling) heaters. Sinopé Technologies manufactures several models of this type of thermostat, and this one is available in your choice of 3,000- or 4,000-watt configurations depending on the load your electric heating system presents. I tested the 4,000-watt TH1120RF-4000 ($79.95 at Amazon) in my West Virginia home, controlling a baseboard heater in an attic space I’ve converted to a bedroom. (the 3000-watt TH1120RF-3000 is priced about the same at Amazon). Since these types of heating systems are not centralized, each one must be controlled individually. That means you’ll need one thermostat for each such heater in your home. Sinopé’s TH1120RF lineup also requires a bridge to connect to your Wi-Fi network (the bridge must be hardwired to your router with an ethernet cable), and from there to the internet. The Sinopé GT125 ($89.95 at Amazon if purchased separately) handles that task for multiples of this type of thermostat. And since most homes will need more than one thermostat, it makes more sense to buy them bundled with the bridge in a package deal. The GT125, incidentally, can also be used with Sinopé’s line of smart lighting controls (the bridge supports up to 250 connected devices on the company’s proprietary Mi-Wi mesh network). The thermostat can also be integrated into a broader smart home system, but you have only two choices on that score: Samsung SmartThings or Control4. The Sinopé TH1120RF is easy to install, since it has only two non-polarized wires. Just turn off the power, take out the old thermostat, and follow the instructions in the box to hardwire the new thermostat to your heater using wire nuts. The TH1120RF measures 4.53- x 5.0- x 1.26 inches (WxHxD) and is equipped with a monochrome backlit LCD display that reports the day of the week, the current time, and the current temperature inside the house and either the temperature target or the outside temperature, depending on how you configure it. Once the physical installation is complete, point your browser to Sinopé’s Neviweb.com site, establish an account, and sync the thermostat with the hub. The Neviweb interface is currently only accessible via a web browser, but the company is developing a smartphone app that it intends to release later this year. The user interface allows you to establish a heating schedule based on up to six temperature targets for each day of the week. That enables you to save energy by doing things like lowering the temperature minimum to 65 degrees at 11:00 p.m., when you anticipate being snug in your bed; raising it to 68 degrees at 7:00 a.m. while you’re getting ready for work; and then dropping it again when you leave for work at 8:00 a.m.; and then warming the room you expect to occupy when you get home from work. You can program separate temperature schedules for Saturday, Sunday, and any other days you’ll typically be home. There’s a smart option for early warming as well, in which the thermostat estimates how long it will take for the heater to reach your desired target temperature. It will turn the heater on early enough for the room to reach that temperature by the desired time. That’s about it for smart features, however; there are no motion detectors onboard, and there are no algorithms designed to automatically create heating schedules by learning when the room is typically occupied and when it’s typically vacant. Neviweb, however, will track your heater’s energy usage, so you can monitor how often it turns on and how much it’s costing you to operate. Whether you’re at home or away, you can log into Neviweb at any time to adjust the thermostat’s temperature, put the heater in standby or away mode, and establish email alerts based on temperature parameters. 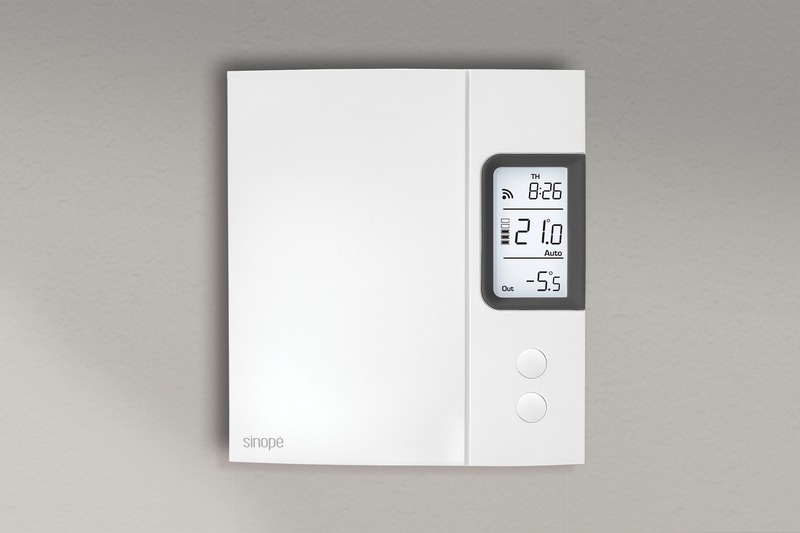 If you thought you didn’t have a smarter option for controlling your electric heating system, give Sinopé’s offering a look. It’s not as sophisticated or as pretty as some of the smart thermostats designed for centralized HVAC systems, but it’s leagues better than the dumb solution you might have thought you were limited to.